Wednesday 21st October 2-for-1 eats | Kerbside | Fortitude Valley Kerbside has a 2-for-1 dinner deal every Wednesday night that will have you and a friend fed for less. Tuck into two crispy chicken schnitzels with salad and fries for just $16 – that’s you and your mate’s dinner sorted for $8 each! You’ll even have change left for a beer. Thursday 22nd October Winemaker’s dinner | Mondo Organics | West End Bannockburn vineyards and Mondo Organics have partnered up to put on an evening of gastronomic grandeur. Four absolutely grape courses will be served on the night, each perfectly paired with a Bannockburn wine for $115pp, with dishes like grilled lamb fillets with pea basil puree and Cape Grim sirloin with stuffed trotter on the menu. Friday 23rd October Valley Fiesta | Fortitude Valley Held over 3 days, Valley Fiesta is a jam-packed music, art and food festival that boasts some of the best local (and not so local) bands matched with delicious food from the precincts best venues. Events over the three days include a Dinner Under the Stars in Bakery Lane and a Fiesta Feast, which will take over Chinatown for a day of food and booze, but you can check out the full line-up of events and plan your weekend here. 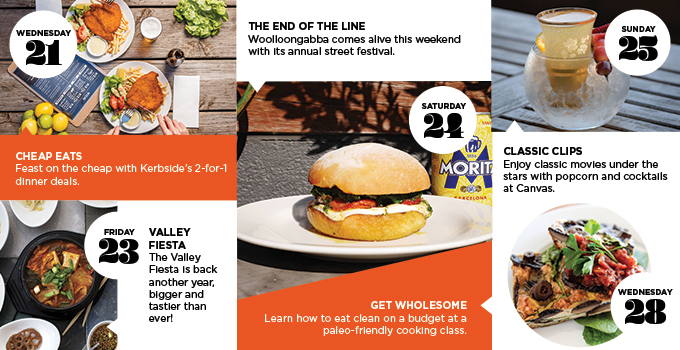 Saturday 24th October The End of the Line Festival | Woolloongabba Woolloongabba’s streets will come alive this Saturday as the annual End of the Line Festival returns to the suburb with alfresco dining, live music, food trucks, market stalls, art installations and even comedy. Starting at 10am, the free festival celebrates Woolloongabba’s unique characteristics of food, music and eclectic wares. If you can’t make it in the morning, don’t worry, because the party will keep kicking until 10pm. Sunnybank Food Tour | Sunnybank Plaza | Sunnybank Over three hours, tour guide and experienced chef, Tony Ching, takes small groups of participants on a wok through the best places to eat and shop in Sunnybank Plaza. Join in the lunch or dinner tour and you’ll get an Asian feast included in $68 ticket, as well as hints and tips for Asian cooking and a goodie bag to take home. Sunday 25th October Movie night | Canvas | Woolloongabba For date night with a difference, snuggle up in Canvas’ courtyard under the stars and take in a classic movie on the last Sunday of every month. Tickets are just $10, and include popcorn and a cocktail while you watch favourites like Singing in the Rain and Ferris Bueller’s Day Off. Shared Harvest No. 3 | Woolloongabba Social Club | Woolloongabba Hear about our food system and how we can improve it over delicious local produce turned into creative cuisine by King Arthur Café at Shared Harvest No. 3. The team from Grown & Gathered will be talking, with a Q & A afterwards. Tickets are $40 and can be found here. Wednesday 28th October Paleo cooking class | Wholesomeness | The Grange Want to know how to make food prep healthier and easier? Book in for a healthy, paleo-friendly cooking class at Wholesomeness, where you’ll learn how to create nutritious meals from a healthy (and budget friendly) shopping list. With healthy smoothies, functional food snacks and quick and delicious dinners guaranteed to give you more energy but not take up all your time and money, you’ll be feeling more wholesome in no time. Thursday 29th October Jägermeister party | Bavarian Bier Café | CBD Step Oktoberfest up a notch at the Bavarian Bier Café’s Jägermeister Party on Thursday October 29. Flying Stags and Jäger shots will give you (or make you think you’ve got) the moves like Jäger when you dance the night away to the Haus DJ and live entertainment. 4 Pines brewery tasting | Riverbar + Kitchen | CBD Join the team at Riverbar & Kitchen on Thursday, October 29, from 6pm to celebrate the last day of their Craft Beer Month. The brewers behind the golden goodness that is 4 Pines Brewing Company will be attending and chatting about their brewery and brewing process for the keen beer enthusiasts of Brisbane. The night will be filled with beer tastings with matching nibbles and live entertainment by The Satellites, making for the perfect after work event! Friday 30th October Day of the Dead Festivities | Sin Vida | Fortitude Valley It’s freaky Friday with a difference at Sin Vida who will be kicking off their Day of the Dead celebrations for the weekend! Skip the tacky Halloween celebrations for Sin Vida’s Day of The Dead banquet. For bookings of four or more, partake in a shared dining banquet for $35pp and get into the action with traditional entertainment, sugar skulls and face painting. Saturday 31st October Good Food & Wine Show | Brisbane Convention Centre | South Brisbane Did you say wine appreciation? We’re there! Watch your favourite celebrity chefs create masterpieces live on stage at the Good Food and Wine Show at the Brisbane Convention Centre over 3 days. Headline acts of a different kind are in store for the show with appearances from George Calombaris and Adam Liaw from Masterchef. Walk in for the wine and leave with goodies and tips to create your own good food at home…it’s a win wine situation.